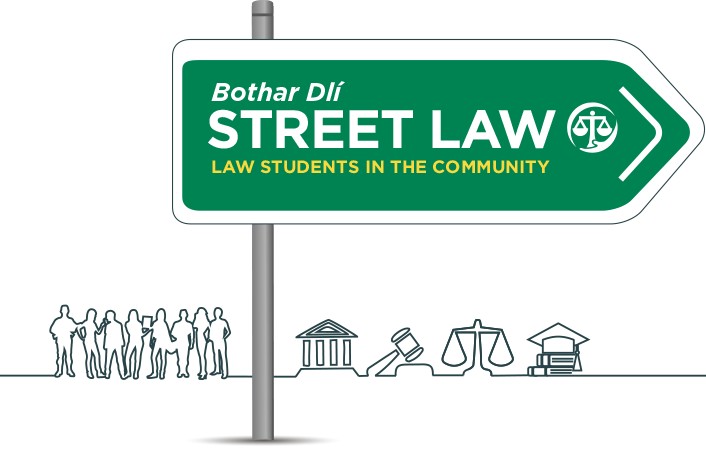 In September 2016, the Department of Law and Humanities at LYIT introduced a Street Law pilot programme, aimed at providing legal education to the community. This was and is the first Street Law programme at undergraduate level in Ireland although the Law Society of Ireland run a very successful Street Law programme for the professional training of solicitors. Students from the final year of the Law and Criminal Justice programme volunteered to participate and were chosen following an application and interview process. Their experience began with a two-day Street Law Orientation held in LYIT which was facilitated by Freda Grealy and John Lunney of the Law Society of Ireland. The students then went on to deliver 8 lessons in County Donegal to transition year students in both Mulroy College, Milford and St Columba’s Comprehensive School, Glenties. The pilot was a resounding success from all perspectives (being both second and third level students and their respective teachers and academic mentors). Street Law is now an elective module in our Law programmes. Students who choose it will gain 10 credits towards their degree on successful completion of the module. Professor Richard Roe, along with colleagues from Georgetown University, visited LYIT in January 2017 to run the Street Law orientation programme which is essential training for the students before they start to teach. The law students then delivered a series of lessons (generally comprising two hours contact a week) to transition year students in four schools in County Donegal culminating in a competitive inter-school Mock Trial that was hosted in LYIT. The success of the programme was evidenced in the Mock Trial where all students participated and many excelled. Learn and develop new skills through teaching. Necessary to organise and plan. Learn to translate complex legal issues in a way that is easily understood by the community. Empowered by the learner centred approach. Helps them to understand their legal rights and responsibilities. Develops their ability to recognise, prevent and potentially resolve legal problems. May even inspire some future law students! Focus not only on ‘what the law is’ but encourages discussion of what they believe the law ‘ought to be’. Practical approach, with the motto: ‘talk less – teach more’ focuses on collective and group learning, which provides highly participatory, activity-based lessons. The module is digitally supported using this website to facilitate interactive learning. It also includes a repository of teaching and learning resources, which can be shared to facilitate replication of the programme by other institutions. This sharing of resources is an integral part of the Street Law ethos and methodology. This sharing of resources also applies to practical expertise, for example, Rick Roe and the Georgetown Team who travelled to LYIT for the 2017 orientation have also trained Street Law providers from all around the world. Recipients of this training include Freda Grealy and John Lunney, solicitors at The Law Society of Ireland who run the Street Law programme in the professional practice course for prospective solicitors. The Law Society in turn has generously shared this expertise with us at LYIT, acting as mentors and trainers to help us on our way. It is anticipated that graduates of the street law programme will also reciprocate and return to help in the training of future Street Law trainees. Ultimately, we hope that the law students at LYIT will be bringing legal information to the community through Street Law for many years to come! Letterkenny Institute of Technology has provided legal education for more than 30 years and the Department of Law & Humanities currently offers law degrees with a strong emphasis on clinical legal education and practical modules. These modules include Work Place Learning, Restorative Justice, Alternative Dispute Resolution, Law in Action as well as Street Law and Mooting. The Law with Criminal Justice is a 3-year Level 7 programme which can be followed by the Law with Criminal Justice (Hons) which is add-on level 8 programme a further year. The Bachelor of Laws (LLb) is a 3-year level 8 programme. Both of these degree programmes are validated by The Kings Inns and are recognised as qualifying law degrees for admittance to the entry examinations for The Law Society of Ireland.